German philologist; born at Hamburg Sept. 18, 1824; died at Bonn May 26, 1881. 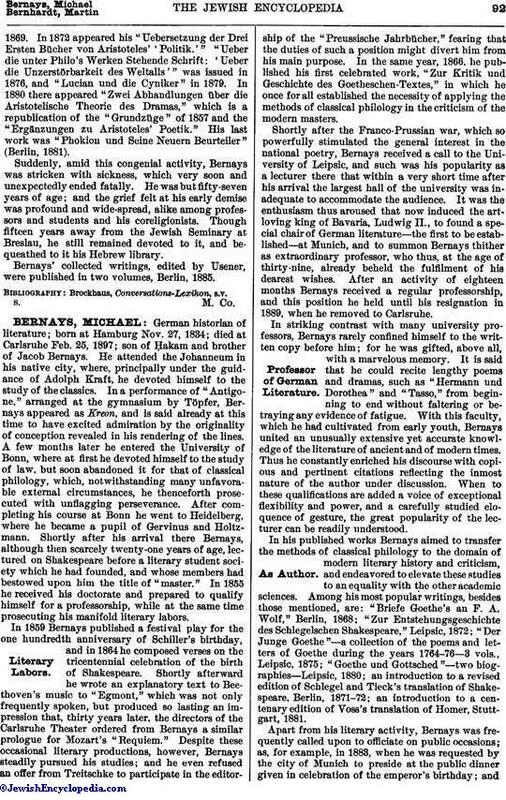 He was the eldest son of the ḥakam Isaac Bernays, who carefully guided his elementary education until he was sent, in 1844, to Bonn to attend the university. There he studied philology under G. Welcker and F. Ritschl, becoming particularly attached to the latter. His philosophical studies he pursued under Brandis. It was during his four years' career at the university that in competition for a gold prize he submitted a treatise on Lucretius, which won for him not only the prize, but also the admiration of Ritschl, who strongly advised him to devote himself to a professional career. The work was afterward published under the title "Die Ausgabe des Lucretius" (Leipsic, 1852). Bernays graduated in 1848, and in the same year issued his "Heraclitea" (Bonn, 1848). In the following year he became privat-docent at his alma mater, and in the same year published at Bonn his "Florilegium Renascentes Latinitatis." He was also engaged in editorial work on the "Rheinische Museum," founded by Niebuhr, and conducted by Welcker and Ritschl. The serious work of organizing the Jewish Theological Seminary at Breslau, the funds for the establishment of which had been provided by Jonas Fränkel, was actively begun in 1853, and the work was practically of a pioneer nature. Bernays was among the first to be called upon to be associated with Zacharias Frankel, Graetz, and Joël in this task of outlining the plan and method of study to be pursued in the new seat of learning, where rabbis were to be trained in accordance with the scientific educational ideas of the time, instead of with the antiquated methods of the yeshibah. Bernays was indeed peculiarly fitted to cooperate in such an undertaking; for, besides his profound classical learning and his university experience, he was a thorough Hebrew scholar and, moreover, was intensely Jewish in thought, feeling, and mode of life. 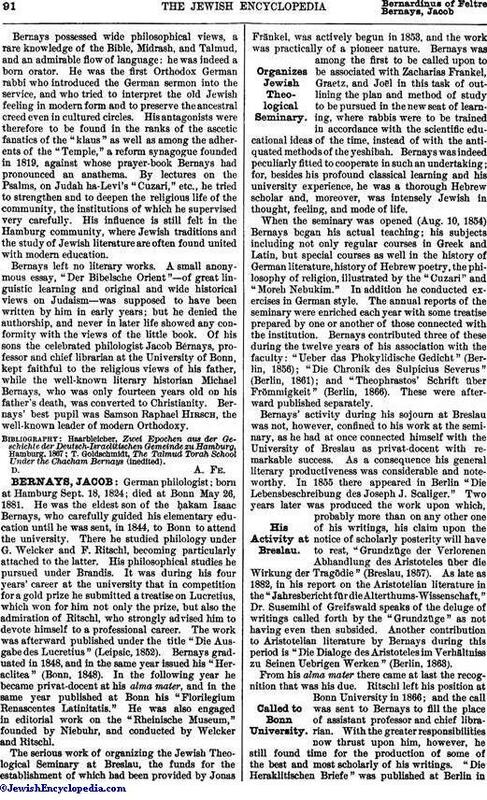 When the seminary was opened (Aug. 10, 1854) Bernays began his actual teaching; his subjects including not only regular courses in Greek and Latin, but special courses as well in the history of German literature, history of Hebrew poetry, the philosophy of religion, illustrated by the "Cuzari" and "Moreh Nebukim." In addition he conducted exercises in German style. The annual reports of the seminary were enriched each year with some treatise prepared by one or another of those connected with the institution. Bernays contributed three of these during the twelve years of his association with the faculty: "Ueber das Phokylidische Gedicht" (Berlin, 1856); "Die Chronik des Sulpicius Severus" (Berlin, 1861); and "Theophrastos' Schrift über Frömmigkeit" (Berlin, 1866). These were afterward published separately. Bernays' activity during his sojourn at Breslau was not, however, confined to his work at the seminary, as he had at once connected himself with the University of Breslau as privat-docent with remarkable success. As a consequence his general literary productiveness was considerable and note-worthy. In 1855 there appeared in Berlin "Die Lebensbeschreibung des Joseph J. Scaliger." Two years later was produced the work upon which, probably more than on any other one of his writings, his claim upon the notice of scholarly posterity will have to rest, "Grundzüge der Verlorenen Abhandlung des Aristoteles über die Wirkung der Tragödie" (Breslau, 1857). As late as 1882, in his report on the Aristotelian literature in the "Jahresbericht für die Alterthums-Wissenschaft," Dr. Susemihl of Greifswald speaks of the deluge of writings called forth by the "Grundzüge" as not having even then subsided. Another contribution to Aristotelian literature by Bernays during this period is "Die Dialoge des Aristoteles im Verhältniss zu Seinen Uebrigen Werken" (Berlin, 1863). From his alma mater there came at last the recognition that was his due. Ritschl left his position at Bonn University in 1866; and the call was sent to Bernays to fill the place of assistant professor and chief librarian. With the greater responsibilities now thrust upon him, however, he still found time for the production of some of the best and most scholarly of his writings. "Die Heraklitischen Briefe" was published at Berlin in1869. In 1872 appeared his "Uebersetzung der Drei Ersten Bücher von Aristoteles' 'Politik.' " "Ueber die unter Philo's Werken Stehende Schrift: 'Ueber die Unzerstörbarkeit des Weltalls'" was issued in 1876, and "Lucian und die Cyniker" in 1879. In 1880 there appeared "Zwei Abhandlungen über die Aristotelische Theorie des Dramas," which is a republication of the "Grundzüge" of 1857 and the "Ergänzungen zu Aristoteles' Poetik." His last work was "Phokion und Seine Neuern Beurteiler" (Berlin, 1881). Suddenly, amid this congenial activity, Bernays was stricken with sickness, which very soon and unexpectedly ended fatally. He was but fifty-seven years of age; and the grief felt at his early demise was profound and wide-spread, alike among professors and students and his coreligionists. Though fifteen years away from the Jewish Seminary at Breslau, he still remained devoted to it, and bequeathed to it his Hebrew library. Bernays' collected writings, edited by Usener, were published in two volumes, Berlin, 1885.